News flash: men aren't the only people who enjoy the outdoors. No sh*#, right? But the outdoor gear industry has only recently started to realize that there are more people wanting high quality gear than traditionally fit men. Today, with Nancy podcast co-host Kathy Tu, we're digging in to the fraught relationship between the gear industry and gender. When do women actually need something different and when are companies just looking to make more money by selling women a product that is essentially the same thing... but smaller and pink? And what do you do if the available products - pink or not - don't fit your body at all? Gear in "women’s colors" is often just lousy: metal gear loops become fabric gear loops; pockets disappear; zippers are cheaper, often plastic instead of metal. The first major piece of outdoors gear for women was the sports bra. It was a pretty triumphant development. A female owned company, makes a female designed product, that quickly was adopted by grateful women everywhere. You do have to give the industry some credit. REI, in particular, launched an initiative last year called "Force of Nature", which includes dozens of profiles of all types of female athletes, $20 million dollars pledged to support groups already working to get more women outside, and “a stepped up effort” to develop gear for women that is just as good as men’s gear and actually suited for female bodies. 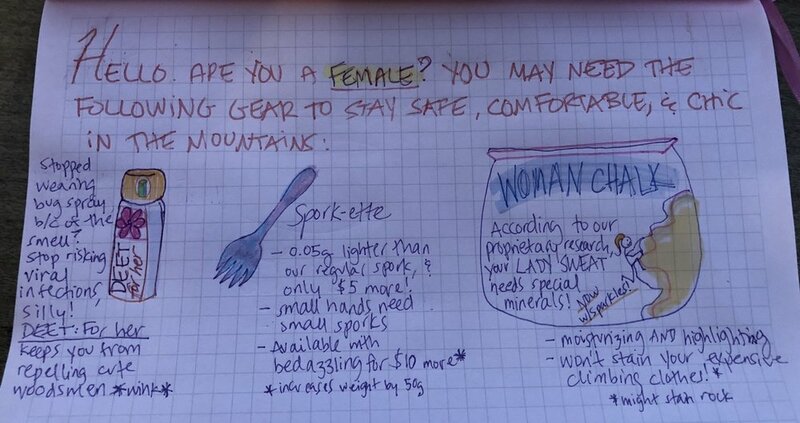 Outdoor journalist Hannah Weinberger made a handy chart to help women determine if they should buy a women's model. She's also got a hilarious doodle. Two words for you: lady chalk. Outside/In was produced this week by Sam Evans-Brown and Kathy Tu, and Taylor Quimby, with help from Hannah McCarthy, Justine Paradis, Nick Capodice, and Jimmy Gutierrez. Erika Janik is our Executive Producer. Maureen McMurray cuts the fringe of all the backpacks. Thanks this week to Summer Michaud-Skog, Elyse Rylander, Hannah Weinberger, and Cordelia Zars.